Ever since I studied abroad in Italy 8 years ago, I have been in love with Limoncello. Unfortunately it is not that easy to find in the US and usually not as good. When Ryan and I were planning our wedding, we decided to toast with limoncello instead of Champagne, since neither of us really like the bubbly stuff. My mom was able to find some decent limoncello that we could use at the wedding, but it still wasn’t the same. Make sure there is no white pith on the peels when you eventually place in the jar with the liquor. There is still some remaining on the image above that I removed. So I decided about a month ago to make my own. I did a bit of research on recipes and reviews. I decided to use vodka for my limoncello since I like the taste of it (several people use grain alcohol). I also decided to use Meyer lemons instead of regular lemons because they were in season. I tweaked a few recipes and came up with the below (updated after first taste test). And, five weeks later it was time to taste! I brought it to Easter dinner with the family to get some good feedback. Unfortunately, it wasn’t sweet enough and it needed a stronger lemon flavor (hey, every once and awhile you have flops)! So I made another batch of the sugar syrup and added it to the limoncello and will re-taste in a 8-10 days, and of course report back. Hopefully I can save it! Peel the lemons. You’ll want to peel long strips along the length of the lemon, pulling off little to no white pith. If you do peel any pith, scrape it off gently with a paring knife. 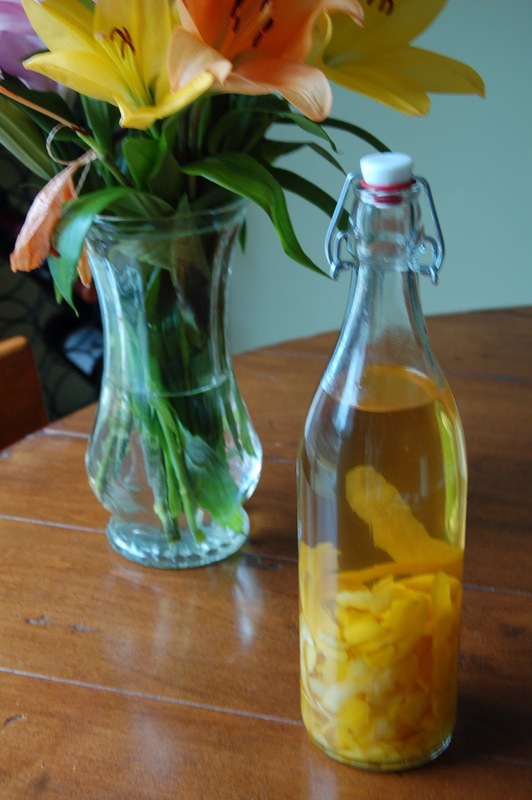 After you’ve let your limoncello cure for your preferred length of time, prepare the simple syrup. When cool, add the simple syrup to the limoncello, tasting as you go. Allow it to rest for another 10-14 days. Finally, strain the lemon rinds and sediment using cheesecloth or a coffee filter. Place the container or bottle in the freezer and served chilled.